Despite losing in its NCAA Regional final, the women’s soccer team won 17 matches and won the first-ever American Rivers Conference title. The Loras Women’s soccer season came to an end last weekend in a heartbreaking game against Wheaton College. The Duhawks came out on top in the first half with an early goal from Schutz in the 7th minute. The game itself was a heart fought battle for both sides, each knowing it was win or go home. 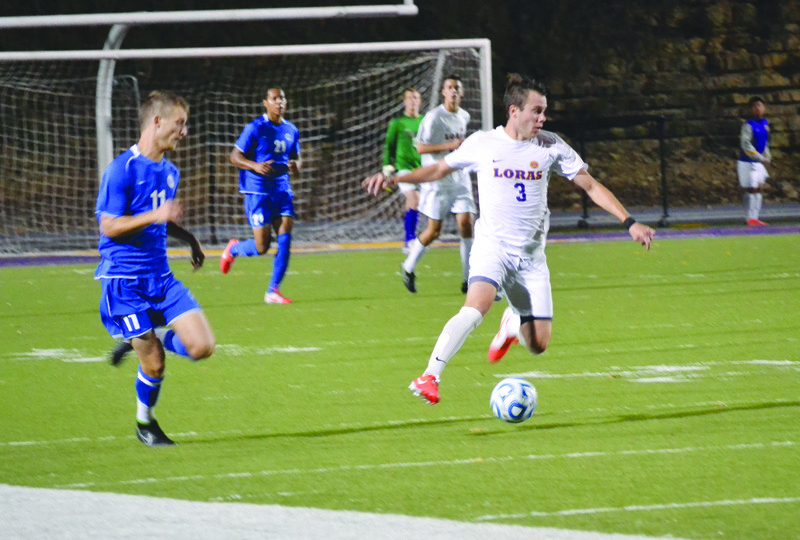 The seniors for the Duhawks laid their hearts out on the field and knew that their previous four years of soccer at Loras had led them to that moment. The 80th and 87th minute brought two goals for Wheaton, giving them the 2-1 advantage and opportunity to advance to the next round of the tournament. The women’s soccer team have been knocked out in the second round of the tournament now for three consecutive years. Senior forward Gretchen Schutz (right) and senior forward Elizabeth Mills (left) are embraced by their coach, Matt Pucci, after a 2-1 loss in regional final. After the game, Coach Pucci said, “It was a great game and finale to our season. We were both two great teams going at it, and I am extremely proud that our team fought to the end. The game did not end how we wanted it, but that passion that our lady’s showed today was amazing. I am thankful for all that the seniors have done for us and our program throughout the years, and they will be missed deeply.” With the season coming to an end, the Duhawks finished 17-4-0. For some seniors, their soccer careers have come to an end. A legacy has been left behind by many, that won’t be forgotten. Loras’ very own Vice President, Dr. Art Sunleaf, tweeted after the game saying, “I love the wins and feel the loses. Yet, I simply cheer from the stands or from afar. 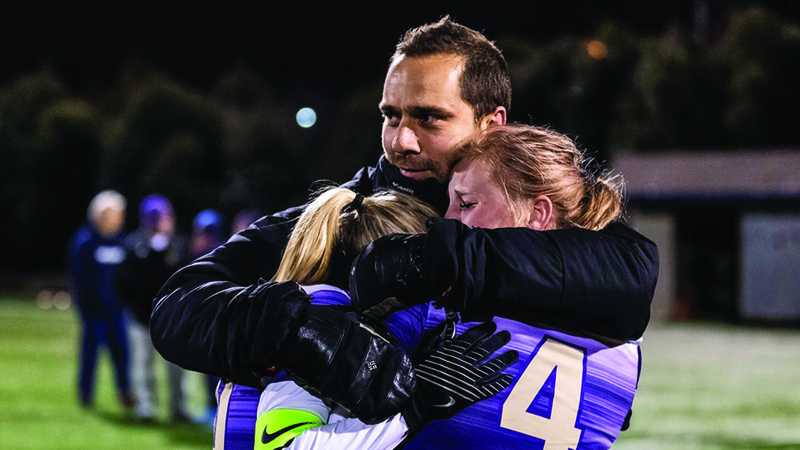 My hat is off to the Loras Woman’s Soccer coaches and players who really do the work for an outstanding year.” While the team might have looked forward to making a further advancement in the NCAA tournament, it is hard not to recognize the great achievement the team made this season. Winning 17 games and being crowned the first ever American Rivers Conference champions is not an accomplishment to overlook. The team had a fantastic season and will lose some seniors who had themselves an amazing journey here at Loras. The team will keep their heads up, and prepare to fight for yet another great season in the Fall.